Step into some Summer fun with the new Aetrex Jamey slide sandal. Get ready for warmer weather with the Aetrex Janey Black sandal. This style is a slide version of the popular Jillian sandal. 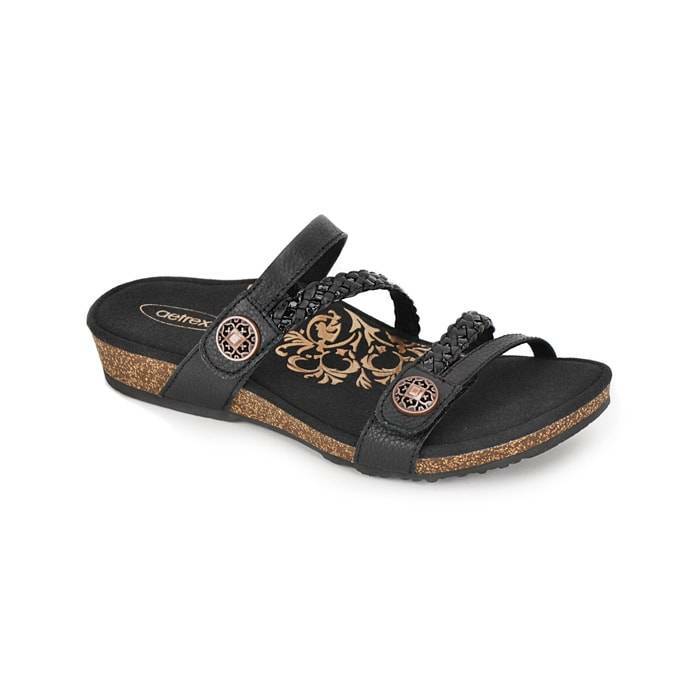 This comfort casual sandal features braided straps, decorative button details, and an adjustable hook and loop strap. Also featured, is a ultra-light cork midsole that absorbs the shock of walking on hard surfaces. In addition, a Met Bar Pod reduces stress on ball of foot. This strappy slide also features the Aetrex “Healthy 3” which features an orthotic Lynco footbed, memory foam cushioning, and anti-microbial technology. Pair this with any of your warm weather outfits.